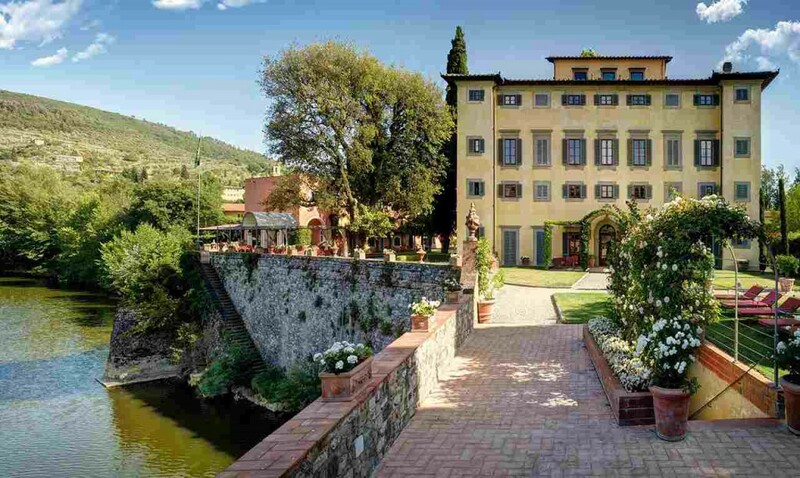 Immersed in the heart of Tuscany, where nature predominates, this splendid mansion is a place where refined elegance beckons total relaxation from the moment you arrive. 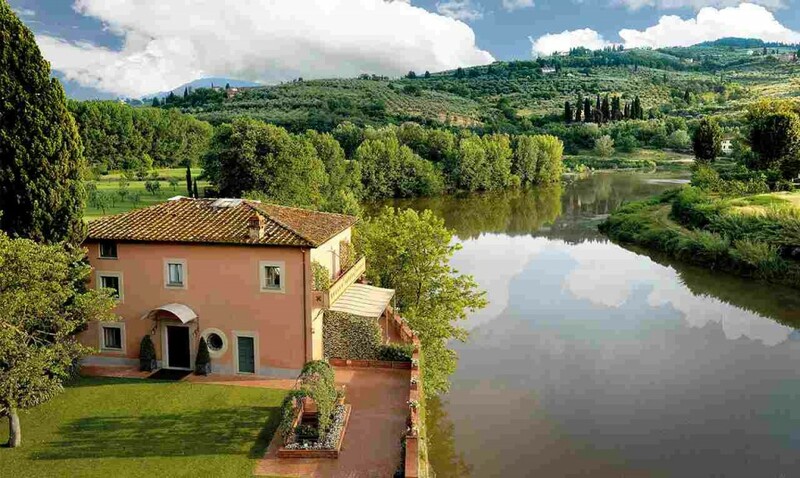 The 16th Century estate sits on the banks of the Arno River, on 22 acres full of lemon trees and olive groves that surround the property. 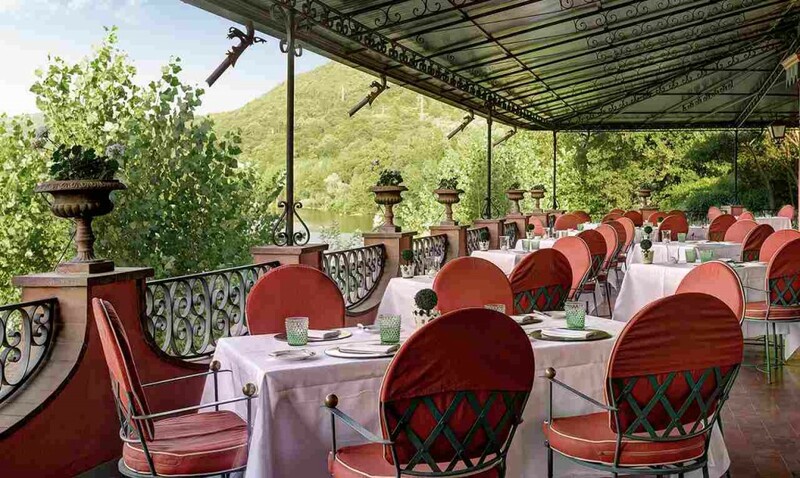 Its reflection on the Arno River renders it almost like a Renaissance painting of the most magnificent bucolic landscape. 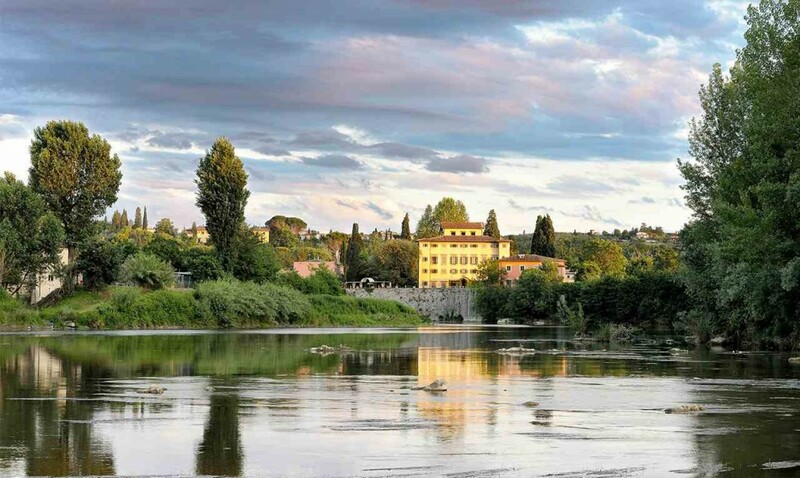 Located just a few kilometres outside Florence, you may wish to immerse yourself in the hustle and bustle of the Tuscan capital city, making use of the comfortable shuttle bus that the hotel provides. 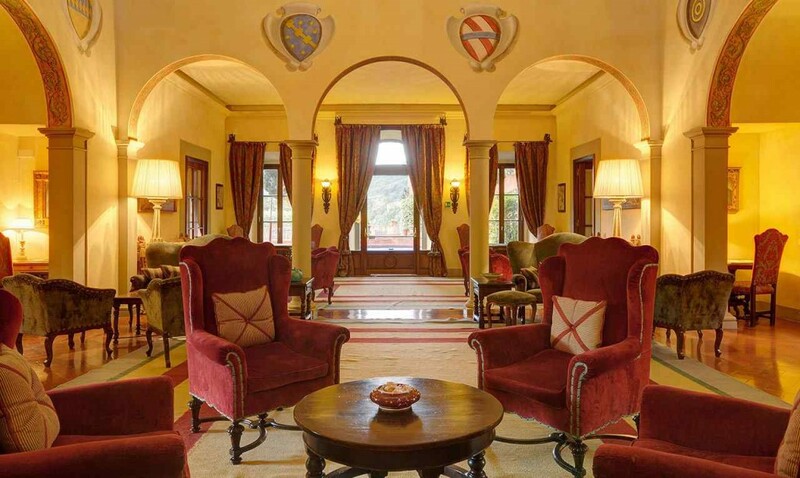 But at the end of a busy day, the peace and serenity of the Villa beckons you-so you return to a place where time and your mind, stand still. Two Villas dating back to the days of the Medici (16th century): the Noble Villa (Villa Nobile), the Old Mill (Vecchio Mulino) and the more recent little Villa (Villino) are the highlights of Villa La Massa which, from an ancient dwelling of the aristocracy, was turned into a hotel in 1948. 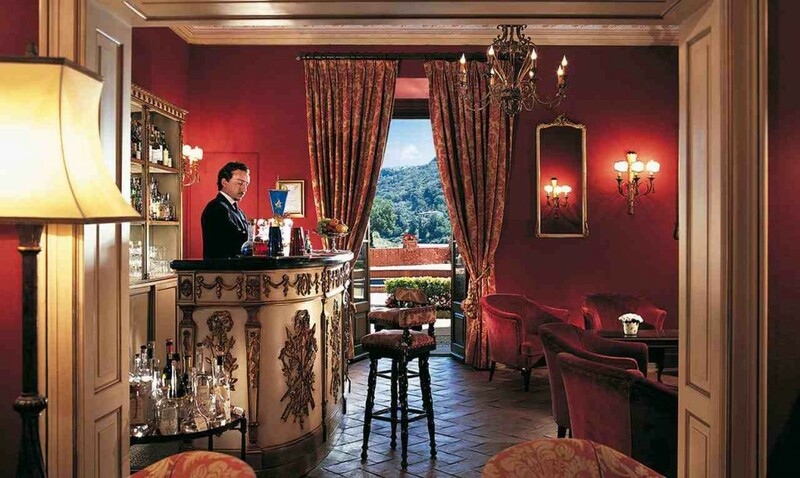 The hotel offers its guests 37 rooms, all different from one another, and all recently refurbished in the traditional Florentine style. 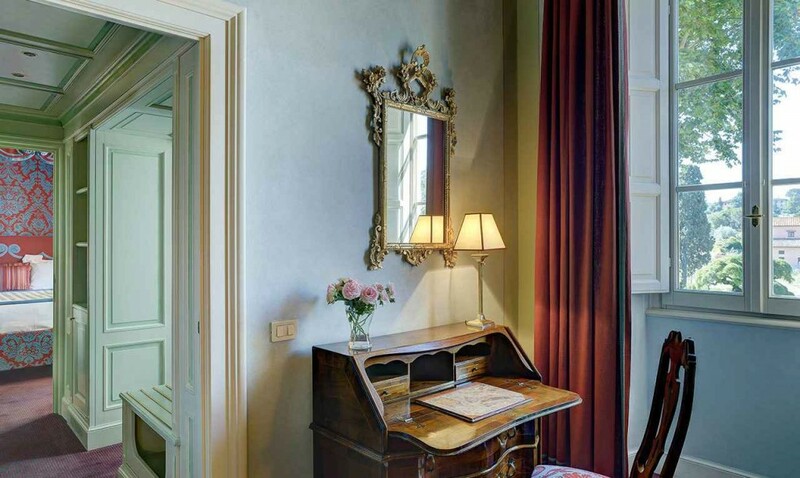 The spacious and airy rooms are decorated with antique furniture, fabrics woven at the historic Florentine textile mills, wrought iron and woodwork from the famous old-time Florence cabinet makers. Bathrooms and their fittings are done in a style reflecting the atmosphere of times gone and are fitted with Carrara marble. 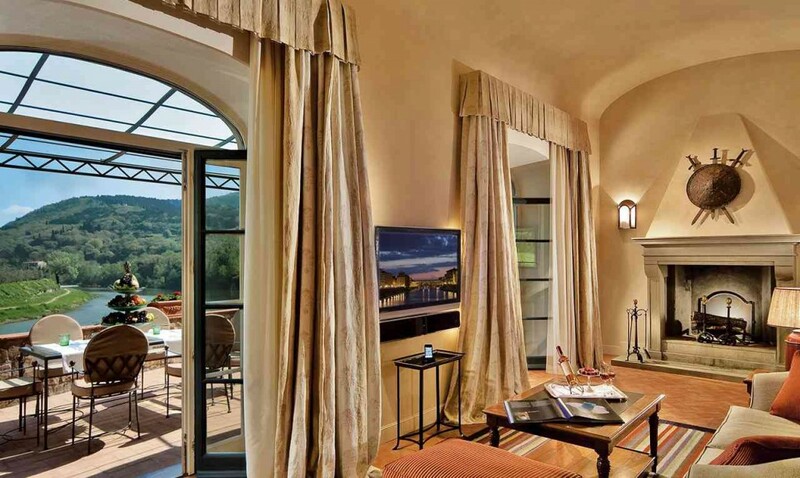 Most have windows framing the beautiful Tuscan landscape. 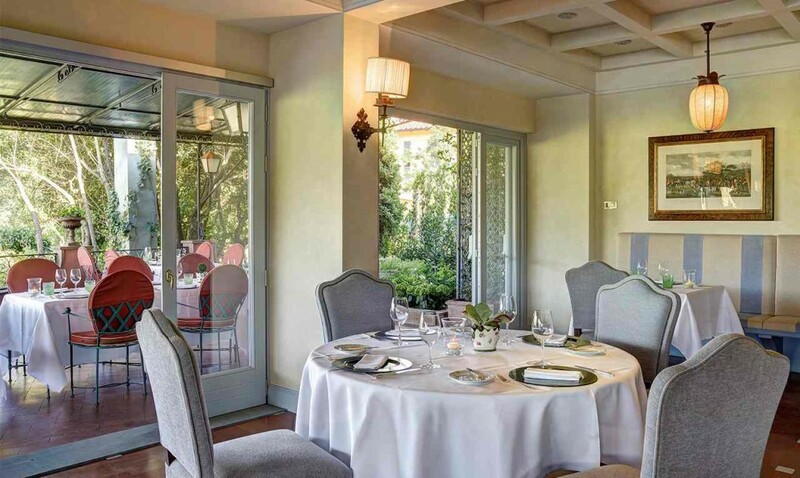 Under the direction of Executive Chef Andrea Quagliarella, menus include both Tuscan regional specialities and Mediterranean specialities, thus offering a broad daily choice. 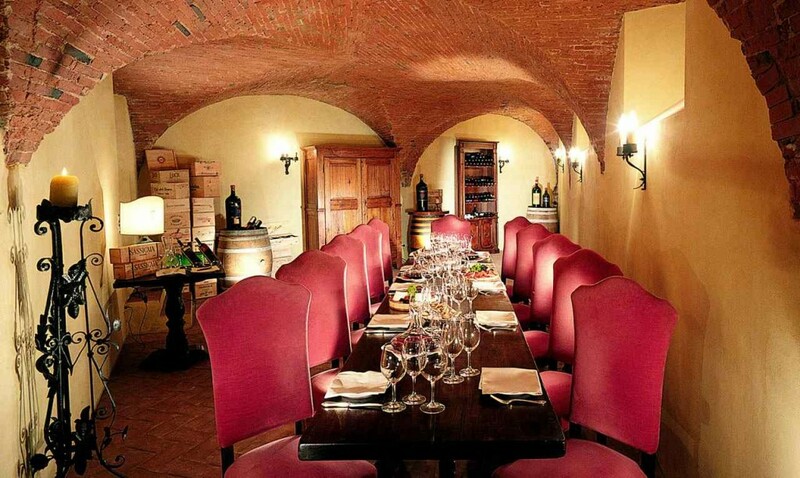 The sommeliers have chosen 400 labels among those best representing the Italian wine culture, with a special focus on Tuscan wines. Utmost care is given to procuring foodstuff of prime quality, with a preference for local and organic products. 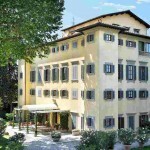 The brand new fitness centre is located in the Noble Villa. Equipped with state of the art exercise machines and audio/visual, it has also a Treatment room offering a wide selection of massages, among which the famous “Wine Therapy” treatment. 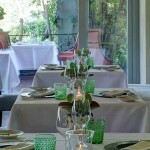 The hotel can also organize yoga classes and massages in the garden upon request. 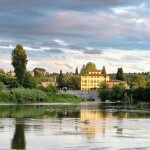 This hotel is located just 15 minutes drive outside of Florence, next to the river. 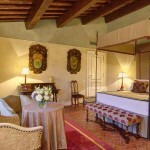 These luxurious double rooms are scattered throughout the three buildings, with views of the Arno river or the gardens. 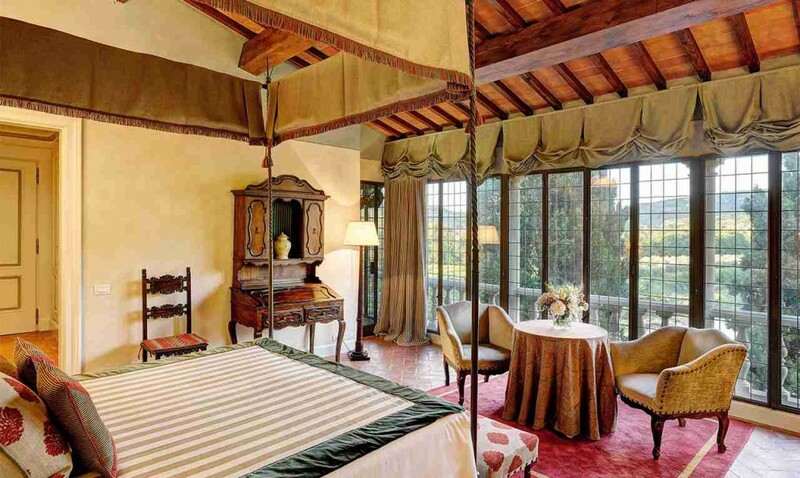 These rooms may have a queen-sized bed or two twin beds, some with a canopy and wrought iron headboards, all with walk-in closet, writing desk, safe and minibar. 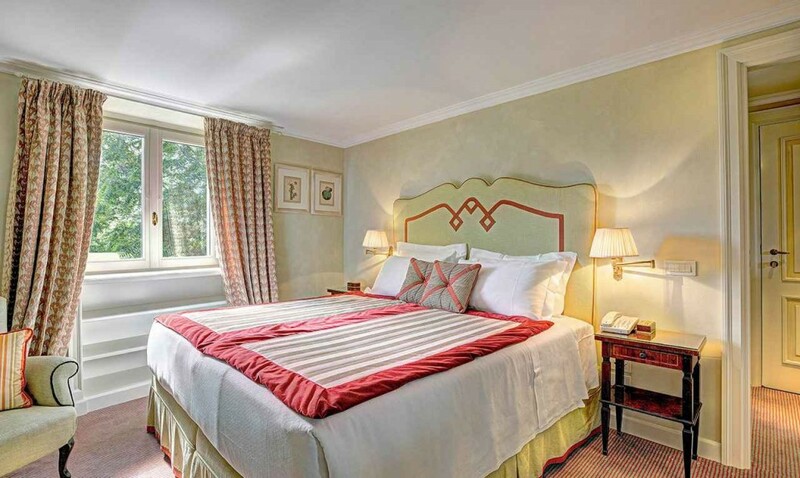 The bed sheets are linen.. Each double deluxe has a magnificent marble bathroom with a view and a large soaking tub for long relaxing baths; double washbasins, jet shower, and our Villa La Massa beauty products, Egyptian cotton towels, bathrobe and slippers. 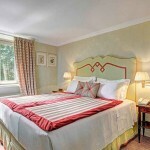 The rooms are equipped with satellite TV, pay per view movies, wi-fi, voice mail and individual climate control. 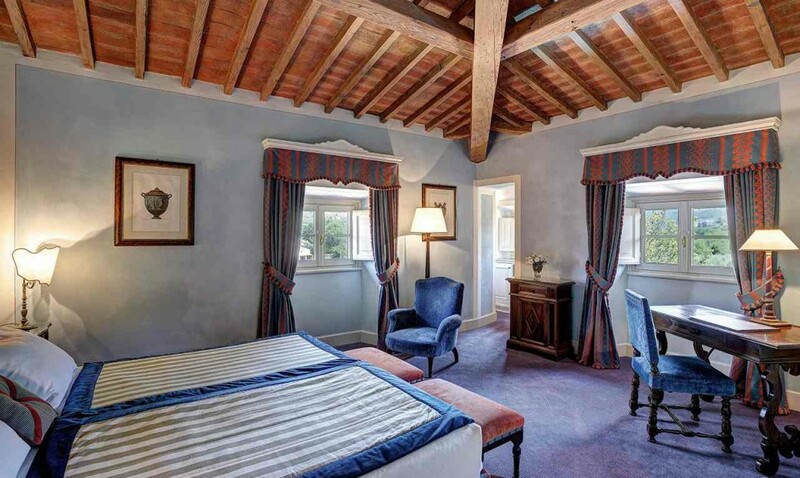 This large room consists of a bedroom with a sitting area, available in all three buildings with a beautiful view of the Arno river or the gardens. These rooms may have a queen-sized bed or two twin beds and each has a walk-in closet, writing desk, safe and minibar. 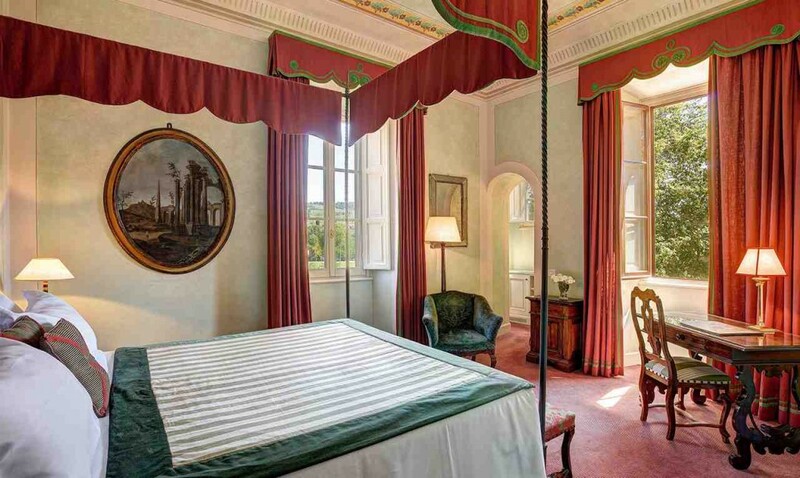 The bed sheets are linen.. Each suite has a magnificent marble bathroom with a view and a large soaking tub for long relaxing baths; double washbasins, jet shower, and our Villa La Massa beauty products, Egyptian cotton towels, bathrobe and slippers. 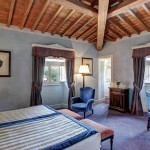 The rooms are equipped with satellite TV, pay per view movies, wi-fi, voice mail and individual climate control. Guests in our Junior Suites receive welcome amenities (i.e. 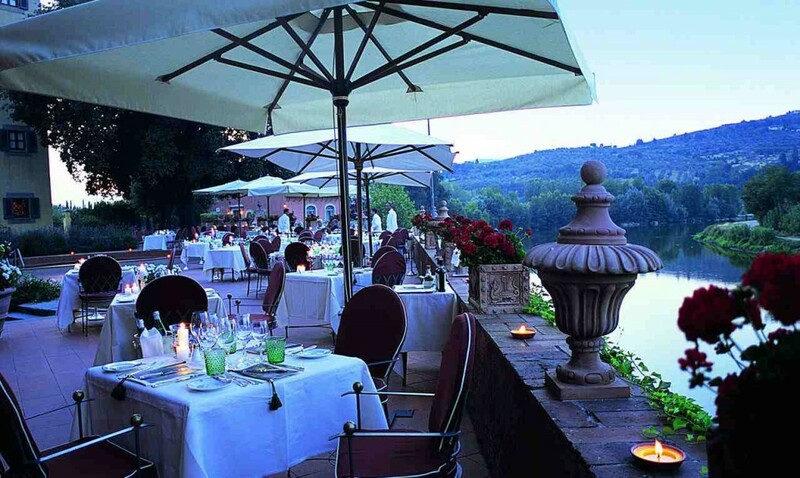 Tuscan wine, traditional cookies, flowers and fruit). 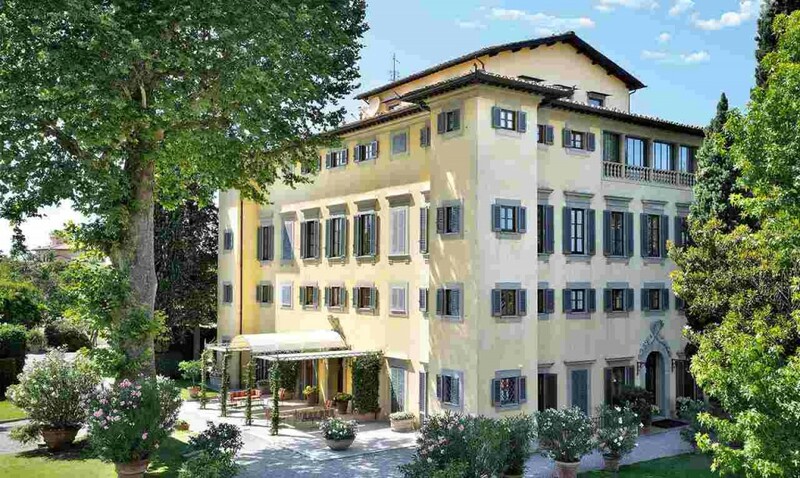 Spacious, comfortable and luxurious, the Junior Suite Top has a large bedroom and living area and these rooms are available throughout the three buildings with breathtaking view of the Arno river. 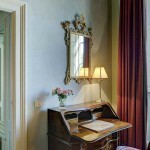 These rooms have a bed canopy and wrought iron headboards or twin beds and each has a writing desk, safe and minibar. 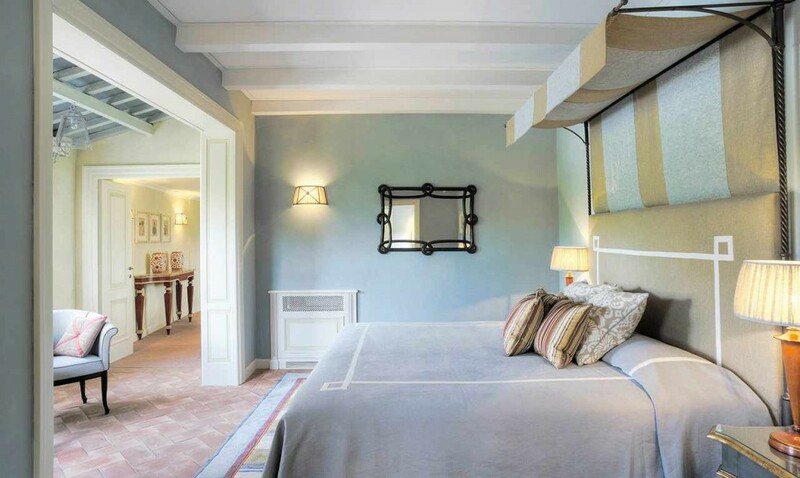 The bed sheets are linen… Each suite has antique furniture and a magnificent marble bathroom with a view and a large soaking tub for long relaxing baths; double washbasins, jet shower, and our Villa La Massa beauty products, Egyptian cotton towels, bathrobe and slippers. Some suites have terracotta tiles. 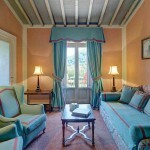 The rooms are equipped with satellite TV, pay per view movies, wi-fi, voice mail and individual climate control. Guests in our Junior Suites Top receive welcome amenities (i.e. 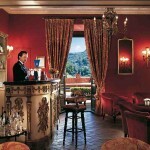 Tuscan wine, traditional cookies, flowers and fruit). 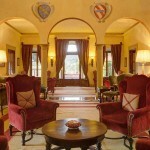 Undoubtedly your home away from home, this is the right choice for long stays or unforgettable special occasions. 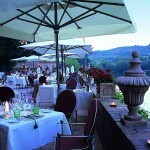 These rooms are located in the three buildings with a spectacular view of the Arno river or the gardens. 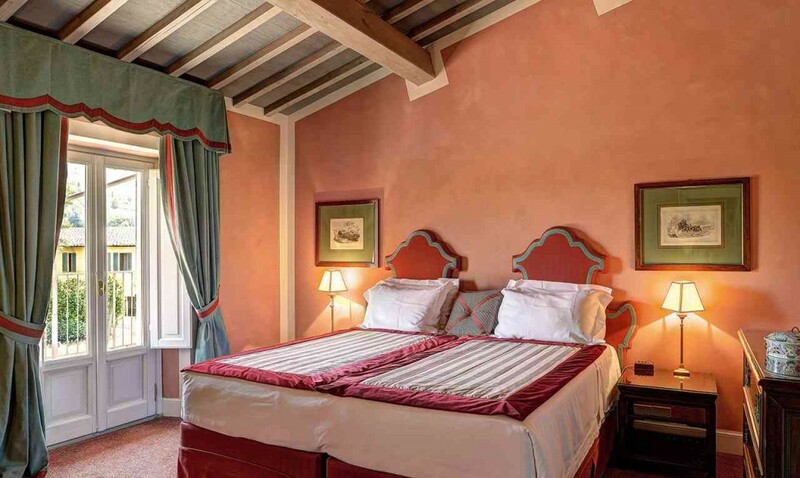 Furnished with antique furniture and fabrics that have been woven at the historic Florentine textile mills, these rooms may have a queen-sized bed or twin beds, some with canopy and wrought iron headboards. 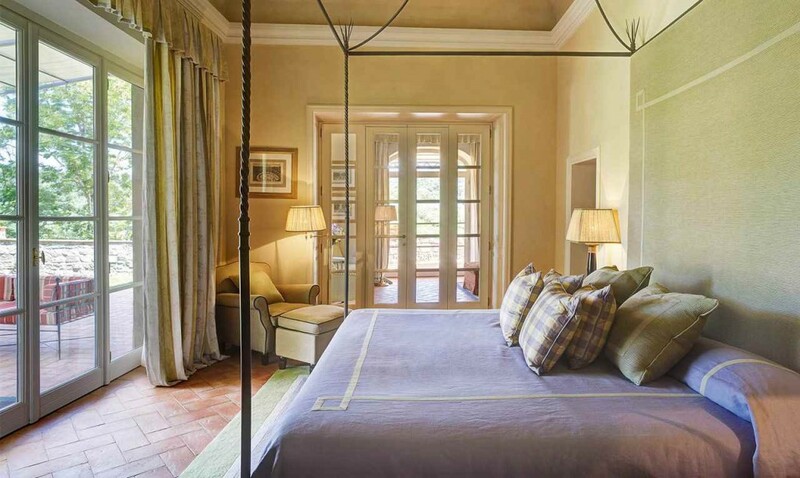 Bed sheets are linen. . All of them have a walk-in closet, writing desk, safe and minibar. 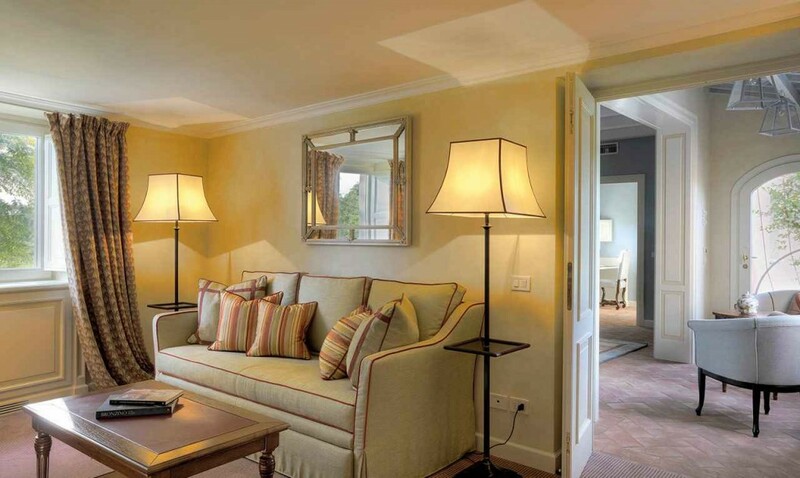 Each suite has a magnificent marble bathroom with a view and a large soaking tub for long relaxing baths; double washbasins, jet shower, and our Villa La Massa beauty products, Egyptian cotton towels, bathrobe and slippers. 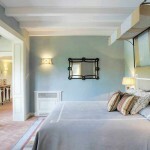 The rooms are equipped with satellite TV, pay per view movies, wi-fi, voice mail and individual climate control. 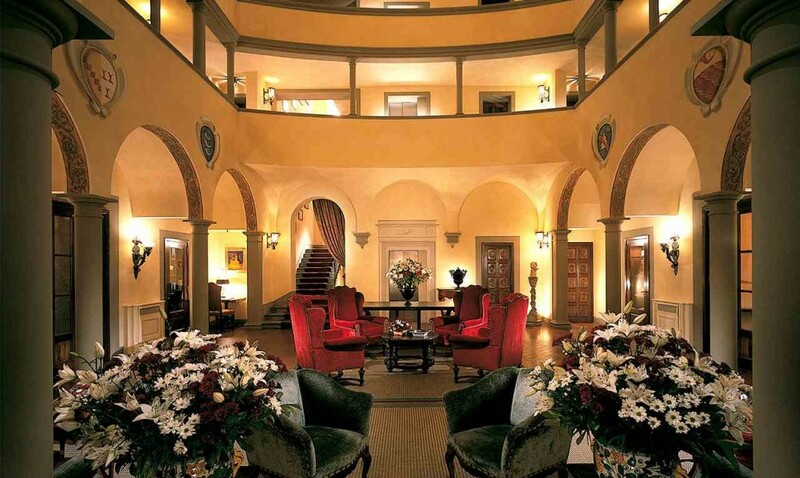 Guests in our Suite receive welcome amenities (i.e. 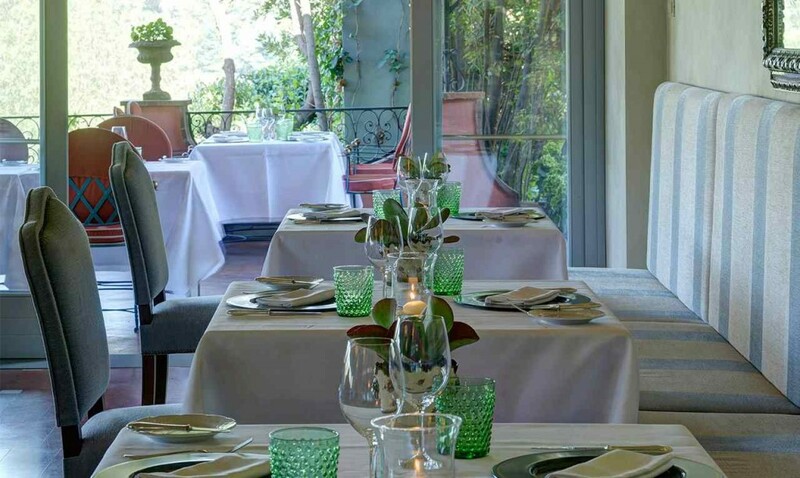 Tuscan wine, traditional cookies, flowers and fruit). 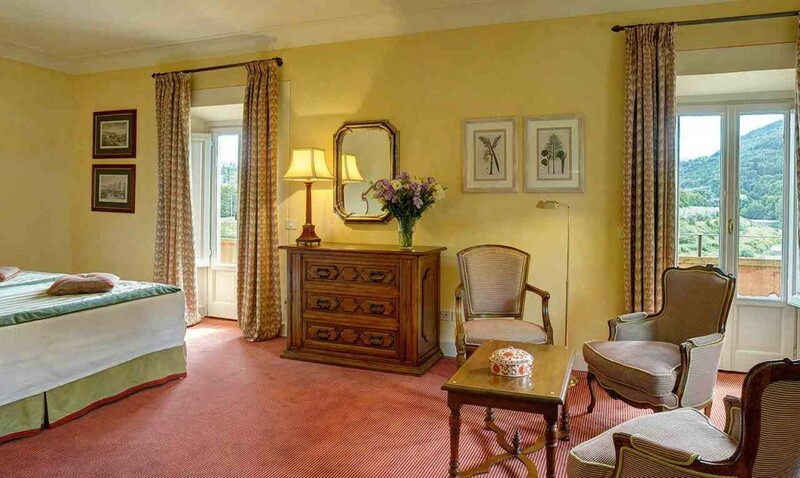 Available in all three buildings, this suite is perfect for special stays. 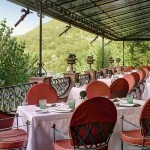 Some suites have a wonderful terrace overlooking the gardens. Each suite is furnished with antique furniture and fabrics that have been woven at the historic Florentine textile mills. 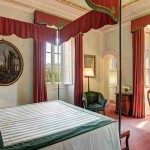 The room may have a queen-sized bed or twin beds, some with canopy and wrought iron headboards and frames, all with walk-in closet, writing desk, safe and minibar. Bed sheets are linen. 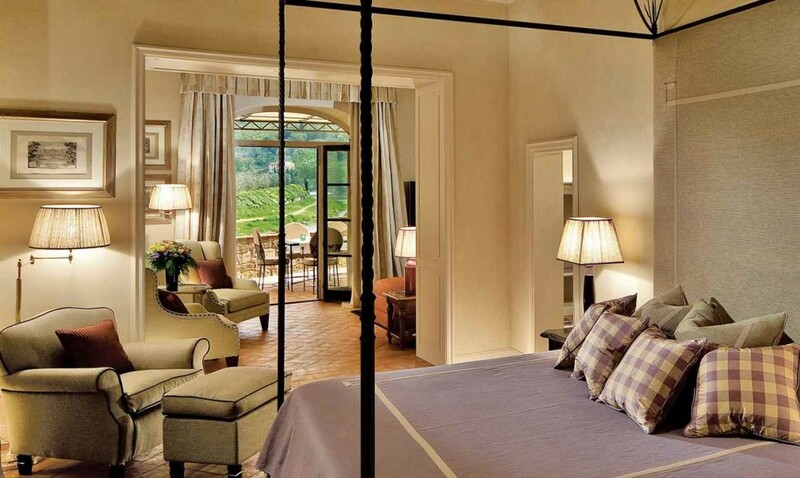 Each suite has a magnificent marble bathroom with a view and with a large soaking tub for long relaxing baths; double washbasins, jet shower, and our Villa La Massa beauty products, Egyptian cotton towels, bathrobe and slippers. The rooms are equipped with satellite TV, pay per view movies, wi-fi, voice mail and individual climate control. 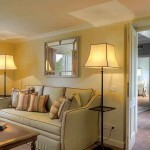 Guests in our Suite Exclusive receive welcome amenities (i.e. 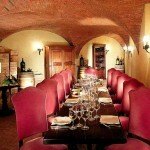 Tuscan wine, traditional cookies, flowers and fruit). 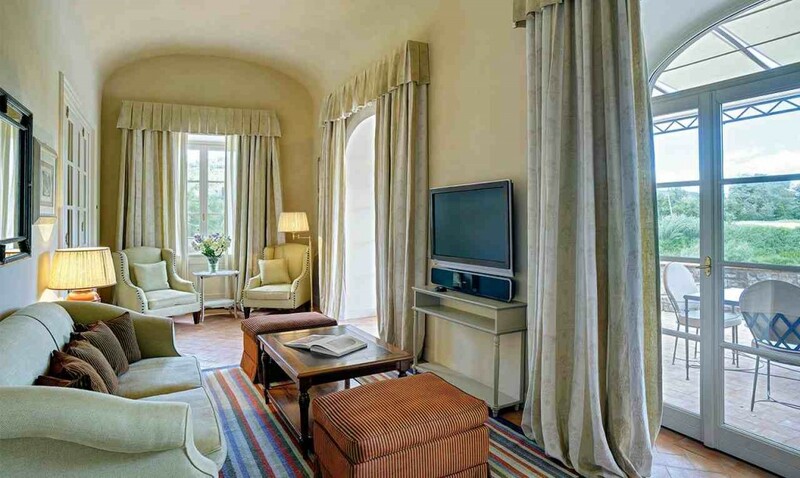 Opened in March 2009, this magnificent Presidential Suite, sits on the banks of the Arno River. 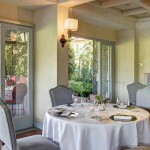 Surrounded by the splendid 20-acre park and the olive oil trees of the hotel and endowed with a private garden, the Suite is composed of 2 spacious bedrooms, 2 marble bathrooms with separate shower, double washbasins, a living room with fireplace and terracotta floor and an ample outdoor space. 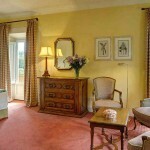 Both rooms have a walk-in closet, writing desk, safe and minibar. 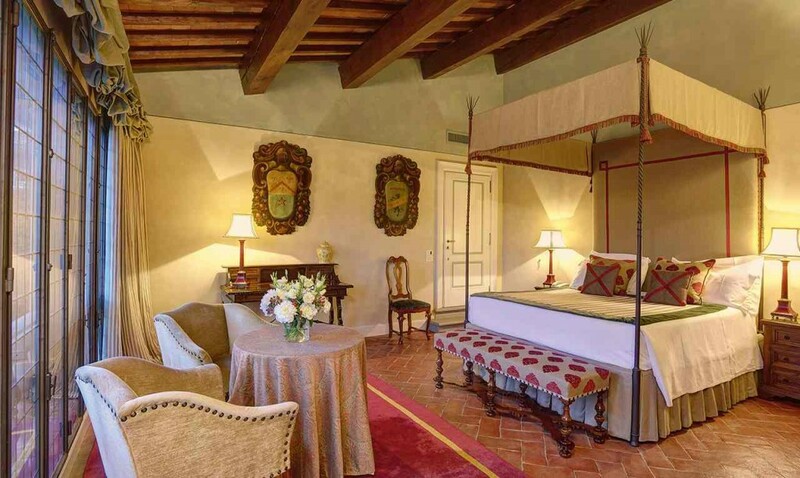 The sheets are custom-made linen.The furnishings and the design of the Suite have been selected respecting the Renaissance atmosphere of the 16th Century estate on which the Suite sits, with a particular eye to the comfort and privacy of its guests. 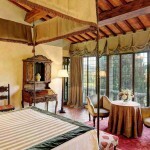 The rooms are equipped with satellite TV, pay-per-view movies, wi-fi, voice mail and individual climate control. 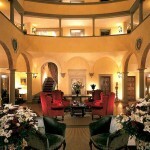 Guests of our Presidential Suite receive a welcome massage of 15 minutes and an amenity from the General Manager (i.e. 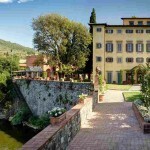 Tuscan wine, traditional biscuits, flowers and fruit). For stays over 3 days, a car with driver for 6 hours will be at the client’s disposition for personalized tours. 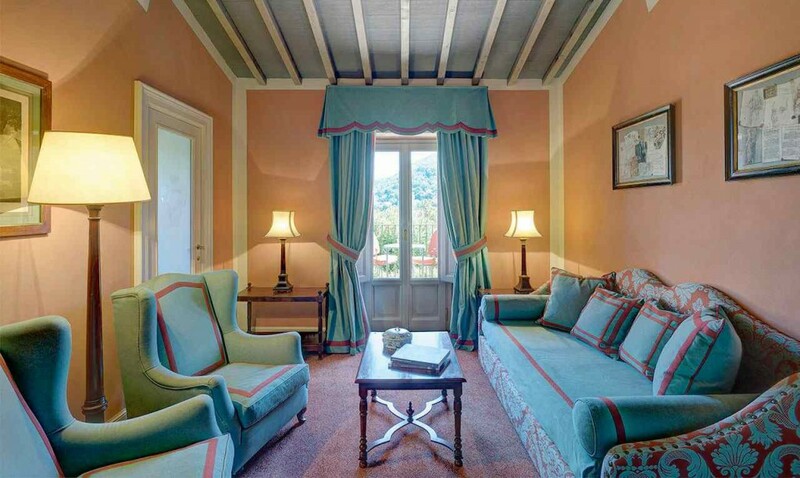 The Presidential Suite is part of the smallest villa on the estate, the “villino”, which has 5 other rooms, making it possible to rent the entire building for larger groups or additional privacy.